This stroller has an adjustable handle (approx. 33in-46in) and has a reversible seat unit for front and rear facing. Stylish and lightweight thanks to the aluminum frame. Easy to fold and unfold with seat unit attached and can be stored in an upright position. The frames cover can be removed easily by the use of zippers. The Click n Move 3 has a big protective sunroof with hard-wearing textiles that silently adjusts and its spacious basket is practical for a diaper bag, a purse and the adaptors for your infant carrier. 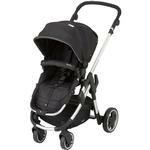 This stylish and lightweight stroller has a modern design and provides many features for a pleasant walk with your little one. The Kiddy Click’n Move 3 offers the highest standards of safety and is easy to fold when you are on the go. 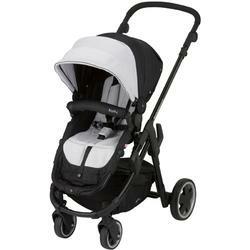 Versatility: This stroller has an adjustable handle (approx. 33in-46in) and has a reversible seat unit for front and rear facing. Safety: Adjustable 5-point harness with comfortable belt padding includes 3D mesh material that prevents from sweating and ensures maximum safety. Bumper bar can be easily removed. Easy to Operate: Stylish and lightweight thanks to the aluminum frame. Easy to fold and unfold with seat unit attached and can be stored in an upright position. The frames cover can be removed easily by the use of zippers. Comfort: Smooth and comfortable ride for your child due to the front and rear wheel suspension design. Standard Features: The Click n Move 3 has a big protective sunroof with hard-wearing textiles that silently adjusts and its spacious basket is practical for a diaper bag, a purse and the adaptors for your infant carrier.